What do IELTS Modules contain? The IELTS paper is divided into four modules – Listening, Reading, Writing and Speaking. You can choose from the Academic Training or General Training versions of the IELTS test. All candidates have the same Listening and Speaking sections for both the versions but Reading and Writing sections contain different types of questions. 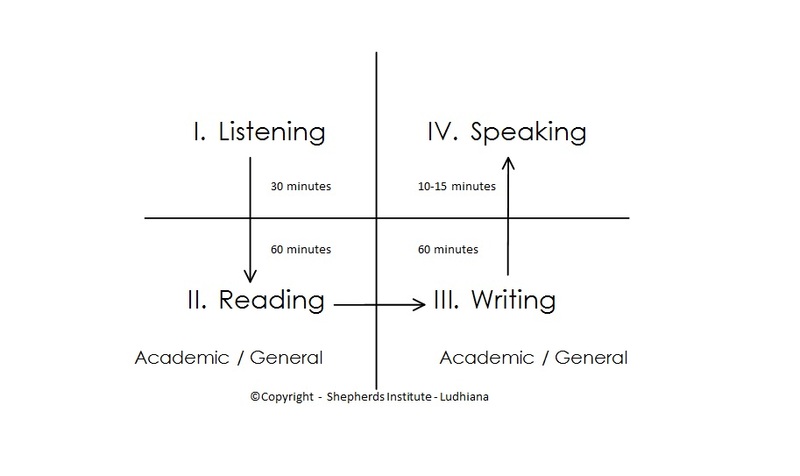 The test has four parts – Listening (~30 minutes), Reading (~60 minutes), Writing (~60 minutes) and Speaking (~10-15 minutes). The total exam time is around 2 hours and 45 minutes. The Listening, Reading and Writing tests are done in one sitting or one day. The Speaking test may be on the same day or up to seven days before or after the day of the other tests.